Here in Omaha the weather has started to cool down. Last night the temperature actually fell into the 30 degree range –that is cold for September. 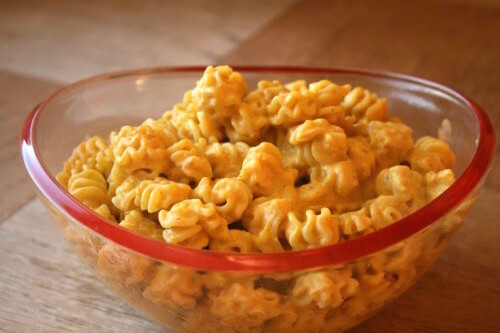 Once thing that is great about fall is the rich comforting foods that I tend to crave. My parents planted buttercup squash in their garden this year, and they brought me a couple when they came to help move us. I wanted to use this squash in a way that was different from roasting it with butter and brown sugar. Although it is delicious that way, I felt the squash deserved something a little more savory. Sometime I read a recipe somewhere using roasted pumpkin and turning into a creamy sauce to serve over pasta. Unfortunately I don’t recall where I read that but it stuck with me. I thought it was an interesting way to use pumpkin that wasn’t a pie, cheesecake, bars, or bread (all of which I love). Last night when I was looking at that squash and wondering how to use it for dinner I recalled the pumpkin pasta. I figured there is no harm in turning one squash into a sauce to serve with pasta. If it totally sucked I would throw out the sauce and just dump a jar of Prego on top of my pasta. Since my husband was still at work while I was cooking he would never have to know. Well, lucky for me the sauce turned out to be delicious. The girls actually asked for a second helping and thoroughly enjoyed the leftovers today for lunch. YAY! This is a real fall winner dinner. Cut squash in half, scooping out and discarding seeds, cut each half in half. Drizzle EVOO over squash pieces and sprinkle with salt & pepper. Place flesh side down on jelly roll pan and roast for 40-50 minutes. When you start to smell it, check on it. The squash should be very tender. The squash skin should peel right off. Mash squash flesh and stir in water (don't add it all) you want it to be wet but not soupy. Over medium heat melt butter in a large skillet. Add half & half and squash puree. Stir until combined. Stir in sage and cinnamon. Heat until simmering, stirring frequently. Sprinkle in Parmesan cheese. Stir to combine. If sauce still seems thick stir in additional water or chicken stock. Toss sauce with pasta and ENJOY! woahmygosh, that looks awesome! and thanks for the tip on using corn starch to thicken. i had no idea that was what the flour was for–learned something new today. That sounds delicious. I don’t know my squashes very well so I’m not sure what a buttercup squash looks like, but I’m sure I can figure it out. I just have to thank you for this recipe, which I stumbled upon one day while wondering what to do w/my buttercup squash. It is sooo good! I’m now making it for the third time this fall and have shared it with friends. Thanks! Thank you for that tip Taylor! 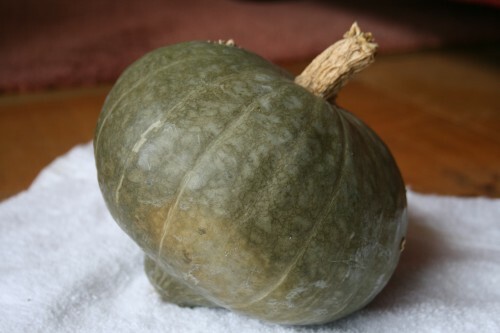 Although they may be interchangeable as most winter squash is similar, the squash in the photo is not a Buttercup (which has an innie belly button), it is a Japanese Kobucha (it has an outtie bellie button). Thanks for that info Michelle. The seed package said buttercup.